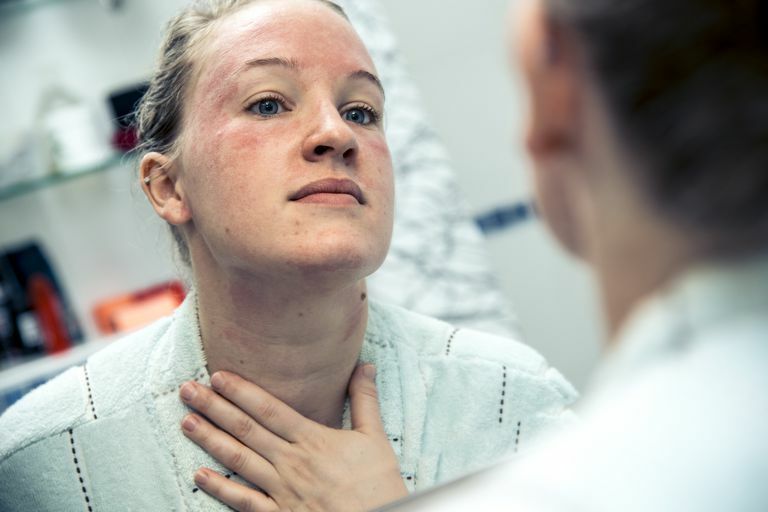 Eczema is the name given to a group of conditions that can cause itchy, red, and inflamed skin, according to the National Eczema Association (NEA). There are many types of eczema including atopic dermatitis, contact dermatitis, dyshidrotic eczema, nummular eczema, seborrheic dermatitis, and stasis dermatitis. A family history of eczema - If a family member has it, you may be likely to develop it as well. A diagnosis of asthma or allergies - If you have asthma or allergies your chances of getting eczema increase. Autoimmune diseases - If you have autoimmune issues, you may be at risk of developing eczema, though individuals with a normal functioning immune system can have the skin condition as well. Your location - Eczema is more prevalent in people who live in the northern hemisphere, metropolitan areas, or places with pollution. Environmental irritants and allergens - These are materials, substances, and chemicals that you encounter on a daily basis. They include (but are limited to) ingredients in your soaps, shampoos, and cleaning products, juices from fruits, vegetables, and meats, perfumes and fragrances, cigarette smoke, contact with metals, fabric and fabric dyes, and more. Common allergens consist of mold, pet dander, dust, and pollen. Stress - To date, researchers aren’t sure why stress can set off eczema, but avoiding stress as much as possible may help reduce flare-ups. Outside temperatures - For many people, heat seems to cause eczema to appear—which can involve sweating, taking hot showers, or humid air. Alternatively, dry skin that’s often a byproduct of the winter months can act as a trigger as well. When eczema shows up on your face, the skin can become red, blotchy, itchy, and flaky. If you vigorously scratch your face, the skin could become infected, thicker, darker, or scarred. Although there’s no cure for facial eczema (or eczema located on other parts of the body), there are plenty of treatment options to make living with this condition more manageable. Use a gentle cleanser - Soap can be harsh and drying on your skin, making eczema worse. Instead, consider a mild, non-soap cleanser. There are many NEA-approved products. Wash your face and shower with lukewarm water - As mentioned above, hot showers can act as a trigger for eczema in some people. To reduce the risk of developing eczema due to heat, wash your face and shower using lukewarm water. Keep your skin hydrated - If you have eczema, your skin may tend to be on the dry side, so it’s important to keep it moisturized. There is an assortment of products to choose from, such as creams, lotions, ointments, and skin barriers like ceramides. Look for products that are dye-free and fragrance-free to reduce your chances of irritation. Be mindful of the sun - If the sun triggers a flare, you may need to wear sunscreen. Generally, products that contain zinc oxide or titanium dioxide are more easily tolerated on sensitive skin, though the one drawback is they can leave a white tint. When you’re out of the sun, wash your face and apply a moisturizer; sunscreens can be drying to your skin. Look for cosmetics with moisturizing ingredients - Having facial eczema doesn’t mean you can never wear makeup, but all products aren’t created equal when it comes to what you can put on your skin. Look for products that have hydrating ingredients like hyaluronic acid and shea butter. Steer clear of ingredients like parabens (a group of preservatives), salicylic and glycolic acids, fragrances, and retinol. Consider over-the-counter (OTC) and prescription medications - If you experience itching and redness, you may benefit from an over-the-counter, 1 percent hydrocortisone cream. These creams are for short-term use, though, as prolonged use can cause thinning of the skin. If the OTC cream doesn’t work, you may need to see a doctor to discuss other prescription options like immunosuppressants and biologic medications. Learn about phototherapy - When treatments are unsuccessful, phototherapy may be the next step. Phototherapy uses a device to emit ultraviolet B light (also called UVB) onto the skin, which reduces itching and inflammation, boosts the production of vitamin D, and enhances the body's natural ability to fight bacteria on the skin, explains the NEA. When you live with facial eczema, it can feel like your face takes center stage. To keep the symptoms manageable, schedule regular visits with a dermatologist. The needs of your skin may vary with seasonal changes and as you age. Your doctor can educate you about new medications and therapies, provide you with options to control symptoms, and help you develop the best skincare regimen to meet your skin’s needs. Remember, what works for one person may not work for another. Additionally, don’t be afraid to reach out for support—either online or in-person—to find out how others cope with eczema. Knowing you’re not alone can make things just a little bit easier. American Academy of Dermatology. What is Eczema? National Eczema Association. What is Eczema? What Does Eczema Look Like in Different Stages? Rosacea, Psoriasis, or Eczema: Which Matches Your Symptoms? Can Probiotics Help With Eczema?